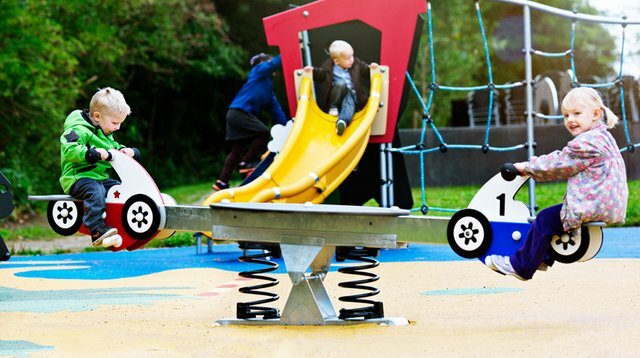 The Motorcycle Seesaw is designed for a child to enjoy movement in the company of another child. The ergonomically-designed footrests and handholds put the child in control of his body and allow him to utilize all his strength making the seesaw move up and down. Reaching a smooth movement requires coordination between the two players, resulting in the use of lots of physical energy and coordination skills. The rhythmic movement feels good and supports the child’s development of her sense of balance. The two children have eye contact all the time when they play, encouraging conversations and a lot of giggles. The horse theme will inspire pretend play and conversations as well.